Facebook has designed a system that would allow individuals and advertisers to make direct connections to those physically nearby that share similar interests or are open to receiving certain advertisements. The company's work was outlined in a U.S. patent filing for a "wireless social networking" system that was published this week and represents a further step towards advertising and communication that is locally targeted. Under the envisaged system, a wireless device would establish a connection with other wireless devices nearby. The communication wouldn't run via the Internet but would be based on a direct link between the devices. Each device might be linked to one or many other devices, depending on the density of people in a certain area, and each would be open to sending, receiving and relaying messages as part of the mesh network. Because the network is based on direct connections, the approximate location of users can be determined. For example, if a device has a 100 meter range then all other devices it is in direct contact with could be determined to be within 100 meters. If those devices acted as relays, then a second level of devices could be determined to be within 200 meters and so on. The number of relays, or "hops," lies at the heart of the envisaged system. 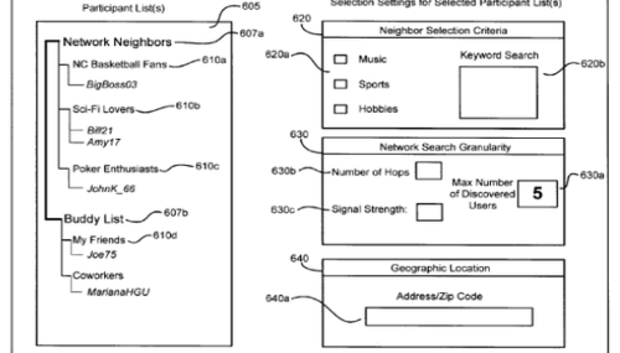 The system outlined in the patent application envisages users setting preferences for receiving or communicating with others based on interest and proximity. Facebook calls the combination of these two factors an "interest metric." "In general, the wireless device may enable messaging communications with wireless neighbors that have higher interest metrics and avoid enabling messaging communications with wireless neighbors with lower interest metrics," the application said. Users would categorize themselves as individuals, businesses and advertisers with further sub categorize for finer distinctions. "In one example, the neighbor type 'restaurant' may be sub-divided into multiple sub-groups, such as 'Italian,' 'Thai,' 'French,' and others. In another example, the neighbor characteristics depend on the content advertised by the neighbor, such as the specific value of store discounts. In addition, the neighbor characteristics may indicate a neighbor's interests or social activities, such as interests in poker, science fiction, or kung-fu movies," the application said. "The user may assign different interest metrics to different neighbor characteristics. Hence, the user may set the interest metrics to the highest value for the individuals interested in poker, the medium value for the stores advertising free pizza, and the smallest value for stores advertising discounts on winter clothes that are less than 20 percent off. As a result, the wireless device may prevent messaging communications with the stores advertising discounts on winter clothes, because these stores' have interest metrics that are too low for the user." Businesses are continually trying to refine their advertising so it only reaches consumers that might become customers. That's especially true of local businesses, which often have limited advertising budgets. That's where the mesh networking trumps an Internet connection, according to the patent application. "Finally, enabling communications based at least in part on network proximity may also assist businesses in identifying potential customers. In one example, the owner of a pizzeria may only want to advertise a '7:30 special' to the customers who are close-by to the pizzeria to avoid advertising to customers who are too far away to take advantage of the '7:30 special.' In another example, a department store with a large number of diverse products may tailor its promotional advertisements to the customers shopping within specific store sections. Hence, customers shopping in a 'Women's Shoes' section may receive advertisements that are different from advertisements received by customers shopping in a 'Men's Suits' section." The system wouldn't be totally focused on advertising -- and that might be key if users were ever to sign on should such a system launch. The interest list would also enable users to find others nearby that shared similar interests and hobbies or act as a filter for discovering existing friends that are in the area. Details are included in U.S. patent application 20130208714 that was published on Thursday. It was filed with the U.S. Patent and Trademark Office on March 14 this year. Patent applications provide insight into the types of projects that companies are working on. They are typically filed early on in the development process and the appearance of a patent application doesn't necessarily mean a future commercial product.